CEEDA or Certified Energy Efficiency Data Center Award was launched as the first independent assessment lead audit of energy efficiency best practice within a data centre environment. CEEDA will be delivered internationally by Accredited Programme Providers and independent qualified assessors and auditors. CEEDA has been structured to help data centre operators via recognition and an expert audit of their live data center facilities. Awarding Bronze, Silver or Gold awards based on specific criteria being met within the data center and its operation. 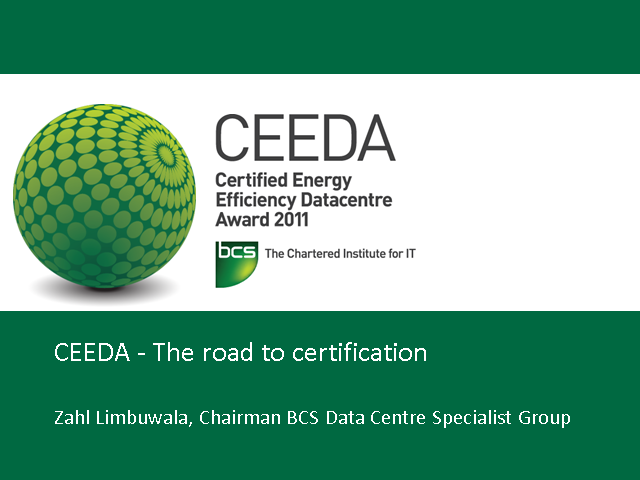 During this presentation, Zahl Limbuwala, Chairman of the BCS Data Center Specialist Group will give an overview of the CEEDA programme, why it was created and how the programme works.